Tapping their way to fame and fortune! It is going to be so awesome. The outfits! The shoes! The performances! This is going to be public humiliation for Lydia on a whole new level. We had many options for you to choose from and this is what you picked for us. Although, I think one commenter had a really great idea for us and we might have to try it in the Spring. She thought Kate should take Intro to Swashbuckling (Fencing and Historical Swordsmanship) and I should take Samurai 101 (Historical Japanese Swordsmanship) and at the end of the classes, we should have a Battle Royale. Cap'n Coupon thinks we should call it "The Battle Royale With Cheese". He also strongly encourages us to do it sober. (1) Because the combination of dancing in special shiny shoes and lethal Isreali hand-to-hand combat techniques is a perfect fit for us. (2) As spies and crime fighters, we think we may need both skill sets. 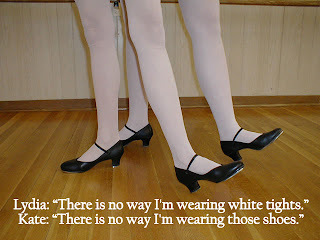 (3) Full contact tap dancing doesn't exist. Yet. (4) We had an imaginary conversation with Dule Hill (our tap sensai) and he told us he strongly approved of this plan. So we're off to register for classes and purchase our new tap shoes! Stay tuned for what comes next!